Try to take a start-up idea as far as you can without building a thing. So I’m kicking off my efforts by launching into a startup ideas brainstorming session. Successful startups (and good designs) all start out as a “big idea”. While thinking of startup ideas seems easy in theory, it is difficult in practice. 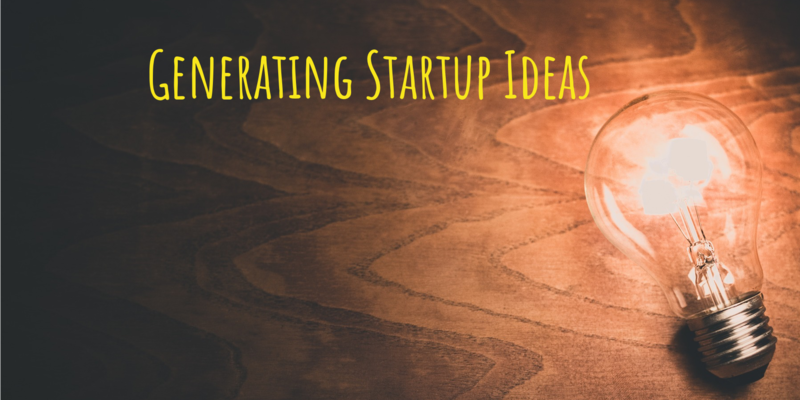 How do you generate an idea? And how can you tell when you’ve found a good one? Previously, I reviewed some of the literature on generating ideas, and found that…. initial ideas can be made better with research. Full disclosure: This process is untested. It is a template I created for myself after reading a lot of articles on brainstorming and startups. So I can’t make any claims, like, “this process is guaranteed to generate million dollar business ideas!” However, I can say that following some sort of process is going to generate more ideas than if you just sat around waiting for them to fall into your head. To kick start our startup idea brainstorming session, we are going to focus on audiences we care about. Start by creating a short list of audiences, or target markets, you are interested in. Give the audience a name as well as a brief description. Try to stay away from broad generalities, like “millennials” or “men in their 50’s”. Instead, try to think of audiences that have a number of unique, distinguishable characteristics. Then, we are going to think of problems this particular audience faces. Try to be exhaustive and list as many problems as possible. You’ve probably picked audiences that you are familiar with in some way, but it is still useful to do some additional research. Check-out discussions on different online communities your audience frequents, and read some articles in periodicals they are likely to read. For example, for my first audience, “men and women in their mid-60s who have recently retired.” I decided to check out AARP. After browsing those articles I came across their Disrupt Aging initiative, which is ripe with information on the problems people face when it comes to retirement and aging. Once you have a list of problems, review each of them and try to think of a potential solution. It is okay to have multiple solution ideas for one problem, or to have the same solution apply to multiple problems. And if you can’t think of a solution for a particular problem, that’s okay too. Just leave it blank for now, you may come back to it later. And lastly, rinse and repeat. Whenever you feel like you’ve run out of ideas for one audience, move on to the next one. You can move back and forth between your different audiences to help keep your brain fresh and the ideas spinning. You might also want to put your notebook down for a few days, and pick it up again when you have an thought about more research you can do.